In recent years, natural gas consumption in the United Kingdom has grown rapidly. At the same time, there has been an abrupt change in UK natural gas supplies, brought about by depletion and decline. In the first part of this two part series, I look at historical developments in EU and UK natural gas consumption, production and imports and the challenges posed by declining production. In the second part of the series, I use a simulation approach to test the likely adequacy of natural gas supplies during the upcoming heating season. In these simulations, I use data from the UK Department of Business, Enterprise, and Regulatory Reform (BERR), UK National Grid, as well as information about recent UK Continental Shelf (UKCS) and Norwegian Continental Shelf (NCS) develpments. Based on what I refer to as the reference scenario, it seems likely that the UK will increasingly have to rely on Liquefied Natural Gas (LNG) imports to secure adequate supplies. NOTE: Click this and other images for larger version. In recent years, the UK has become increasingly dependent on natural gas as its primary energy source. This strategy may soon be found to be based upon poor assumptions/perceptions regarding development of domestic and neighbouring natural gas reserves and, in general, regional and global supply capabilities. UK marketable nat gas production (also gross) peaked in 2000 close to 110 Gcm/a. During the last three years, UK nat gas production has declined at an annual rate of 8 - 10 %, which many energy analysts expect will continue. Nat gas constituted more than 38 % of the UK primary energy consumption in 2007. Several analyses expect UK to import 80 % of their nat gas consumption by 2020. UK was a net exporter of nat gas for a brief period. In 2007, more than 38 % of the UK's primary energy consumption came from nat gas. Of the EU/OECD countries, only Italy has a higher portion of nat gas consumption. In comparison, the USA gets 25 % of its primary energy consumption from natural gas; France, 15 %; and Germany, 24 %. In general, high nat gas usage is primarily found among countries with huge nat gas reserves like Russia, where nat gas amounted to more than 57 % of primary energy production in 2007. Russia is the world’s largest exporter of nat gas and second largest exporter of oil, so this high domestic usage frees up oil for export. Since oil generates more income than nat gas, based on units of energy exported, this approach maximizes export revenue. The UK and Continental Europe have both benefitted from the bidirectional Interconnector that since 1998 has allowed for increased flexibility in nat gas supplies. Due to the decline in UK indigenous supplies and a tighter supply situation on Continental Europe, the importance of the Interconnector is expected to slowly diminish unless future Russian supplies are shipped through the system to UK. Figure 1: The diagram above shows the development in nat gas consumption for EU, production within EU and Norway and projected growth in consumption (1,4 % annually from EIA IEO 2008) for EU towards 2020. Nat gas production within EU was on a plateau from 1996 to 2004 and has now entered into terminal decline. Increased nat gas production from Norway (which is not a full EU member) has slowed the decline. The balance of consumption within EU has been secured through increasing imports, primarily from Russia, North Africa and LNG. The diagram above suggests that imports into EU will need to grow quickly, from 200 Gcm/a at present to projected 400 Gcm/a by 2020, to fill the rapidly growing gap between declining supplies and projected growth in consumption. If projected growth in EU nat gas consumption by 2020 is to be met, it will be necessary to double present imports of 200 Gcm/a from Russia, North Africa and LNG, a challenging task. With the ongoing credit crisis still unfolding, an increase in imports that allows maintenance of present EU consumption levels may turn out to be a major accomplishment. As of 2007, 25 % of EU’s nat gas consumption was imported from Russia. Russian nat gas exports to the EU grew substantially after the completion of pipelines between Western Siberia and Europe by the mid 80’s. There are good reasons to believe that the Russians (meaning Gazprom) planned their exports to the EU based upon available official data and forecasts from amongst others, EU members and Norway. This is of course a sensible thing to do if the goal is to maximize the profits from the Russian resource base and to optimize the allocation of investment funds. Why invest in expansions of production and infrastructure, if these investments are likely to contribute to an oversupply and a subsequent downward pressure on prices? Perhaps what is needed is an energy czar. I think it was Matt Simmons who first used the expression “energy czar”, perhaps with a hidden meaning that Russians leaders far better understand the strategic nature of energy than their western counterparts, even though their access to data is not as good. In 1995 - 1998, the UK exported nat gas to Ireland. In 1998, the Interconnector, the bidirectional pipeline between Bacton in UK and Zeebrugge in Belgium, started to flow. After that, the UK became a moderate exporter of nat gas to Continental Europe. EU production of natural gas has peaked, and is expected to decline. EU exclusive of UK nat gas production peaked in 1996. Since then, natural gas production has been in a general decline and is expected to continue to decline. Recently Dutch authorities confirmed that their nat gas production is set to decline. These milestones were passed without much attention. For the next several years, projected increases in Norwegian nat gas production are expected to partly offset declines in production in the EU, but the overall production trend is expected to remain downward. UK has for some years had an important role in securing a unique flexibility with respect to the EU nat gas supply chain. The combined effect of the declining nat gas production in UK and the rest of the EU has already tightened the supply situation for EU (ref the recent price growth within the liberalized UK market), and has the potential to develop into a severe nat gas supply crunch. Such a supply crunch could have cascading effects, and may affect other energy systems. These interrelationships seem to be poorly understood among those responsible for developing energy supply strategies. Figure 2: The diagram above shows the development in total energy consumption in UK between 1965 and 2007, split among primary sources. Total UK energy consumption has seen little or no growth; however nat gas has increasingly been substituted for coal, and to a lesser extent, oil. The switch from coal to nat gas has also had beneficial effects on the emissions of greenhouse gases. There is no doubt that nat gas is an efficient, cleaner source of energy when it comes to cooking and heating. More recently, it has also gained popularity for electric peak shaving and electricity production due to the low initial investment required and its responsiveness. Figure 2 also illustrates how slowly changes in the energy mix take place. It is often stressed that investment in energy infrastructure is a long term undertaking. A homeowner who buys a new appliance or a business that invests in an industrial application will have to live with the decision for decades. If the chosen energy source becomes less available or loses price competitiveness over time, it becomes hard to switch to alternatives. Imagine a household that has based its cooking and heating needs on nat gas--what would it take (meaning cost) to change to electricity or coal or any combination of other energy sources? Figure 3: The diagram above shows the history of UK nat gas production, consumption, net exports and imports for the years 1970 - 2007 and projected production to 2015. UK nat gas production grew rapidly in the 70s and 80s, with a steep build-up towards 100 Gcm/a in the 90’s. The UK had a high degree of energy self-sufficiency during this period. In the late 70’s and early 80’s, UK production was mainly complemented with nat gas from the Norwegian part of the Frigg field, which has now closed production. The projected decline in indigenous production will have to be met with a steep growth in imports to maintain or grow consumption. It is now estimated that imports will have to grow from the present 20 Gcm/a to 60 Gcm/a by 2015. Most of this growth is now expected to come from LNG. NOTES: The remainder of the diagrams in this post are based upon the most recent monthly data from BERR converted to daily volumetric figures. The conversion applied is 1 Scm nat gas approximates 11 kWh, based on an industrial standard. The monthly figures from BERR are divided by the number of days (thus creating daily averages) in the respective months. This means that the consumption/supplies on any day may be higher or lower than depicted in the diagrams. Figure 4: The diagram above shows the variations in the UK nat gas marketable supplies through the year and the year over year decline from 2002 until recently. It also shows the average consumption for the years 2002 - 2007 throughout the year. For the upcoming heating season, National Grid expects the indigenous supplies to decline by 10 % relative to the heating season of 2007/2008 according to this article from Forbes. This suggests increased reliance on imports and increased storage withdrawals during the upcoming heating season if consumption remains close to what has been reported in recent years. 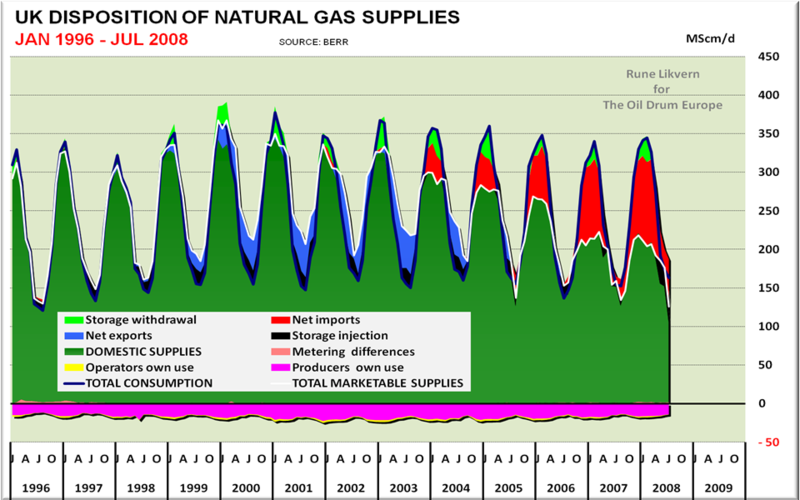 Figure 5: The diagram above shows the disposition of UK natural gas supplies from January 1996 to July 2008. It is worth noticing that as the production grew, the need for storage withdrawals was limited as the fields themselves acted as swing producers. Because of the use of nat gas for heat, nat gas consumption typically shows considerable variation in seasonal consumption. As UK indigenous supplies decline, winter supplies are expected to become increasingly dependent on imports and storage withdrawals. Figure 6: The diagram above shows the development in UK net nat gas imports by source from January 2000 until July 2008. UK imports have recently shown strong growth, but nat gas imported through the Interconnector has not grown proportionally. Imports from Norway have grown substantially in recent years. For the upcoming heating season, there is reason to believe that that Norwegian imports will not grow because of a pipeline leakage affecting production from the Kvitebjørn and Visund fields. The operator of the Ormen Lange field (second largest on NCS and in build-up phase) feeding into Langeled that terminates at Easington has indicated that the drilling program has experienced delays. The Bacton - Balgzand pipeline (in Netherlands) started to flow in November 2006. It is not clear where this natural gas originates from, but in the recent past, these deliveries have played an important role in UK nat gas supplies. LNG imports started in 2005 and grew for a while, but have recently added little to UK nat gas supplies. If the UK is to have adequate nat gas this heating season, greater LNG imports are likely to be required. Figure 7: The diagram above shows the development in UK net nat gas exports by destination from January 2000 until July 2008. Figure 7 shows that nat gas exports from UK to Continental Europe have taken place mainly during the summers. These exports are shrinking, and at some point will come to an end. This loss of supply can be expected to increase Continental Europe's demand for gas by a corresponding amount. The loss of UK exports to Continental Europe will put additional pressure on other sources of imported nat gas (North Africa, Norway, Russia and LNG). As long as the UK had a surplus from indigenous production, it exported a small amount to the Netherlands, which is itself an exporter of nat gas. The UK exports nat gas to Ireland year-around. Ireland is at the end of the pipeline, and depends on UK's exports. Ireland has recently seen strong growth in its nat gas consumption. Presently more than 28 % of Ireland’s primary energy consumption comes from nat gas. Figure 8: The diagram above shows the direction and net flows of nat gas through the Interconnector between January 2000 through July 2008. The diagram above illustrates the diminishing flows in the Interconnector and may serve to illustrate that even if the transport capacities are there, nat gas does not necessarily need to be there. During the heating season, UK nat gas supplies have benefitted from imports from Continental Europe. Figure 9: This diagram is the resultant of figures 6 and 7 above. It illustrates how UK rapidly transitioned from an important exporter of nat gas to becoming a year-around major net importer as of 2007. UK has for some time simultaneously acted as both an exporter and importer of nat gas. For the upcoming heating season, it is expected that UK net imports of pipelined nat gas will remain at pretty much the same level as the previous heating season. May the UK reliance on and dominance of nat gas within its energy mix soon prove to become its Achilles heel? That will be further explored in the second part of this post. Daddy will the lights go out this Christmas? The UK could start by insulating all their older homes to Canadian standards. I'm sitting in a 65 year old building in Alberta where it's 4C. My boiler is off & I have the window open a crack for fresh air. It's been as low as -6C this year, and I've only turned on the heat once. Is it possible to retro-fit older homes in the UK to severely cut back on nat gas to heat homes? Yes it should be possible to fit double glazing, loft insulation and cavity wall insulation to most homes. I think also solar water heating may help reduce consumption for the summer months. This, combined with increased gas storage could help mitigate the UK's increasingly perilous situation. I hope my MP sees this - she said she would check theoildrum since I last saw her and apparently she has now joined the all parliamentary committee on peak oil. Yes it should be possible to fit double glazing, loft insulation and cavity wall insulation to most homes. It should be possible, but almost certainly isn't in the time required. Most people in the UK don't have an energy efficient house and can't afford to make it so. I already have massive loft insulation, double glazing, solar hot water, backup power, smart car, electric bike etc etc - but I still need lots of energy for my house and to maintain my standard of living. I am an early adopter of this stuff, but if even I can't live without substantial quantities of fossil fuels, then I am very sure the rest of the UK (who don't even realise coal production peaked way back in 1913, let alone oil and gas!) have the slightest chance of adapting in time. By 2020 the UK will have a very dire need for imports of nearly all our energy requirements as the coal, oil, gas and uranium don't exist in the UK anymore. Sadly, my monthly experience is that few UK MPs attend the peak oil and gas committee meetings, so, like the Government, they are almost completely clueless as to reality. Personally I am pretty doubtful of how long it will take to bring them on-stream, even if they are usable. coal plants, CO2 emissions aside, are also not hugely different to build from nuclear in some respects, and so give no quick fix. The figure of £160 billion worth sounds bogus though - that would be the value of the power produced, not the cost of equivalent uranium. None of this is of much help for the neat future though, and no matter which way I cut it, it looks like being very cold here for at least the next 20 years. Already as I posted on the energy security blog we are not sure of medicines this winter as they have not ordered ahead. My fear as power is cut is of not just deaths from hypothermia, but actual hunger due to inability to pay for imports as the lights go out for industry. I live in a 50 sq meter condo that was built a generation ago. In a typical month, I use about 65 KWH of electricity (wind powered) & about the same worth of Natural Gas to keep this place at 18C in winter. I live in Calgary, AB, where temps can be as cold as -30C for days on end. I have double windows, very old fashioned, in need of replacing too. How can you use that much in fossil fuels? (my electricity doesn't include my dryer or hot water). Given England's moderate climate, I can't see how you'd even need much heat. What you have could easily be produced with heat pumps or GeoThermal. My family is Scottish (I'm first generation) Canadian...and last time I was in Scotland, it was a vast empty place with a WHOLE bunch of wind/wave power. What would it cost to properly insulate an older home in the UK? 5 000 quid ? For reference I live in a 52sqm end of terrace house. Two floors, roughly the same vintage as your condo. I'm in Scotland. Temps don't go below freezing much. We use 170kwh ish gas per month for our hot water provision. In the middle of winter on top of that we'll use 950 - 1000 kWh worth of gas for space heat. We keep the place at 20C minimum, but we only heat in the evenings and early morning. We don't use the heating while we're at work all day so I'm guessing the average temp is much lower that 20. Our house has decent loft space insultion and good double glazing, but no cavity wall insulation. You're claiming that your heating load is 130kWh per month. Assuming heating 5 months of the year thats 650kWh over 50sqm then you're looking at only 13kWh/sqm/annum heating requirements. If I'm not wrong thats below the Passivhaus standard of 15kWh/sqm per annum. That doesn't sound quite right to me. Having said that 18C - 64.5F is pretty cold for an indoor temp. Meanwhile my house is running at about 96kWh/sqm/annum, which is what I'd expect. PS I'm assuming that your 65kWh of elec is used in base boards and not a heat pump. There are around 12 million homes in the UK. Of those around half are in the two lowest bands for insulation, with 3 million of them being in the very lowest band. Converting them to reasonable standards is a task for many years, and can't be done overnight. Incentives in the UK work on the power companies such that they have little or no incentive to ensure security of supply, or to build storage. We currently have around 12 days storage for natural gas, as opposed to over 90 days for Germany and France. This means that it is nor possible to buy it in the summer when it is cheaper and store it for use in the winter, as we barely have enough for a cold snap. The total of wind power built so far provides less power than one medium size power station, on average. The nuclear fleet is ageing, and contracts have not yet been signed for building new. This means that they are frequently closed for maintenance. In addition, pollution laws mean many GW of stations are due to retire, with a lot of coal stations being retired by 2015. Should one power station go off-line, we would have power cuts, as the margin we have is now down to about 800MW. Effectively, what happens in the UK is rationing by price. The poorest people pay the highest rates, using key meters which are far more expensive than direct debits. The rates are also biased against low users, neatly hitting both the poor and anyone who saves energy, as it is likely to put you into a more expensive, low user band. Some of the recent rises wee up to 70% for the poorest. Should there be a cold winter and supplies be interrupted, perhaps by Russia having to divert some of it's natural gas supplies as they might have to do due to hiccups in the coal supply, then a lot of people in the UK will die of hypothermia. It should be noted that it is 20 years since I have done any building, and some of the materials and techniques mentioned here were not even invented then, and anyway insulation at the time was hardly a priority. Furthermore this is generic, and the precise climate of the area will affect the best approach. Due to the high likelihood of power cuts in the UK, for instance, I would suggest that the best way to prevent pipes freezing in unused areas of the house would either be to drain the relevant area or to make sure that you have a backup power supply for heat tape - it won't use much in the British climate. Plastic pipes also spring back once they unfreeze, although of course they may leak whilst they are doing so. If anyone has any contributions to make, that would help a lot, as I am by no means current in building practise. Rune - This is excellent stuff! More please soon! Dave - I think the message has to be pushed that the economics of insulating homes should be costed at peak winter gas rates (and at what they will be when 'Peak Gas' arrives). Rune - what do you think the cost of a marginal winter therm of gas is now and might be in ten or twenty years time? Day ahead 67 P/Therm as of Oct. 27th 2008. Futures presently around 80 P/Therm (varies slightly with the length of the contract). Oil price at US$60/bbl should result in a nat gas price that now should translate into approximately 70 P/Therm at energy parity. “Normally” nat gas trades at 60 - 70 % of oil at energy parity, which has been a historical trading range in the US liberalized market and this is also the price range found for most of the long term delivery contracts that are indexed towards oil. Futures presently around 80 P/Therm (varies with the length of the contract). This suggests that supply issues presently drive UK nat gas prices. Weather (temperature) hugely impacts nat gas prices in a tight market, but assuming an upcoming “normal” winter, meaning the average of the last 6 – 7 winters, I would expect nat gas prices to go way north of 100 P/Therm (day ahead) at the trading point. The marginal price (P/Therm) 10 or 20 years into the future (I did not know we had one ;-)) is hard to predict, but from what I understand of the European supply picture I would expect it to be considerable higher and it could approach parity with electricity. In my view nat gas is still unbelievable cheap, presently running at approximately 2,2 P/kWh. As a UK resident, I have my concerns about the turbulent future of natural gas in the UK. We have become too reliant on this valuable resource in the last 40 years, and now with the North Sea in steep decline, we are going to lose this local access to a fuel source that we now depend on. The future looks increasingly like a bidding war between Europeans for natural gas on the global market, from suppliers such as Qatar and Russia. For clarification 1 therm is 100,000 BTU or about 29.3 kWh. Most UK suppliers are selling gas this October for about 4.0p per kWh inclusive of standing charges and 5% VAT. Most UK householders will burn between 60 and 120kWh per winter's day - depending on the level of insulation and the outside temperature. Even greater profits can be made for the utilities that convert this gas into electricity in CCGT power plants. However, in the event of a natural gas shortage, will these plants will be quickly taken off line and the gas reserved for heating usage? If the day ahead price is roughly 2.2p /kWh and expected to rise, then we can only expect more sharp rises in the price that the domestic consumer pays. I've hedged my bets by fitting a woodstove with boiler in addition to my condensing gas fired boiler. What was the cheapest, most abundant fuel by far, only 3 or 4 years ago, gas is now no longer as attractive. Most countries on the Continental Europe have entered into long term supply agreements with Algeria, Norway and Russia. Most of the European market has not been liberalized. The German energy company E.On Ruhrgas is the largest foreign owner in Russian Gazprom and by coincidence their stake of 6,4 % in Gazprom closely matches German nat gas imports from Russia relative to total Gazprom production. In 2007 Germany imported 35 Gcm from Russia. 6,4 % of a total Gazprom production of 560 Gcm approximates 35 Gcm. The Germans have always had a long term strategy for their energy supplies and there is one phrase they often revert to “security of energy supplies”. I don’t have any detailed information on the priorities during a gas shortage. From what I have understood consumers with interruptible contracts will first be shut off. If the shortage gap is not closed by this, then electric utilities could be next in line. What then happens could quickly develop into something very ugly, as the UK presently has small generating margins and could result in part of the grid going down (black outs). I think you (and those around you) soon enough will appreciate the woodstove. UK day ahead as of now 73,25 P/Therm. Probably Germany or Denmark are better places to look for energy efficiency ideas. They actually take it seriously here, fuel being far more expensive. So, the rich and wasteful are being subsidised by the poor and thrifty. LOL. Please note that since writing this I have changed my mid about residential solar thermal, which originally thought ineffective in the UK as it does not provide much hot water at peak in the winter, and hence would not help the grid much. It is now apparent that the situation is so dire that any contribution at all is needed, but insulation is still much more cost effective. The thing is though that Germany and Denmark have addressed their problems on a long-term basis, and so have super-insulated large portions of their housing stock, use a lower proportion of gas, have better stockpiling arrangements and long term supply contracts etc - in other words they are far better prepared than the UK, although not so well as France with it's nuclear contribution. In the UK we are just going to have to patch something up on an emergency basis, or freeze, hence my attempt to show some quick bodges to reduce energy use, even if it means living in one room. I have personally bought greenhouse-type bubble plastic, which I will use to seal the windows if we get power cuts. My experience with solar thermal in winter is mixed. At present I have 2 x 20 vacuum tubes heating a 120 litre tank. On bright sumnny days even in the depth of winter this arrangement will add 30-40 degrees of heat to the tank - 5-6 kwh per day. Heavily overcast days and you are lucky to get a 5 degree temperature lift. I had not known that there was such a big difference when it is overcast. The only figures I have seen just contrasted winter and summer, without going into cloud cover. It sounds as though you are getting around 2,000kwh from your set-up, as it would increase the temperature more in summer - is that about right? What was the cost of your system? I would be happy to do that and provide figures and photos. My system as a DIY install came in at about £1150. Installation took about 4-5 days. It basically consists of 2 20 tube panels, a controller, pump, pressure vessel, and a retrofit coil that inserts into my cylinder via the immersion. I have calculated that my set up should deliver 3000-3200 kwh per annum. Typically a 20 tube (47mm x 1500mm vacuum tube) system should deliver 1450 - 1600 kwh annually. I have 40 tubes in total. Today for example the base of my water tank at 8am was 19 degrees. At 6pm 46 - so a 27 degree increase at the base. The tap water is about 65 degrees suggesting some stratifcation in the tank. I would guess todays yield is in the region of 5kwh - not bad less than 55 days from winter equinox. "In addition, pollution laws mean many GW of stations are due to retire, with a lot of coal stations being retired by 2015." This is the EU large combustion plant directive. It's actually worse than just retirement by 2015. Those coalfired powerstations that have opted out of the scheme are only allowed 20,000 hours run time, after January 2008. This means that the operators are now running the coal plant in stop-start mode, in order to try and keep the hours down. This practice does nothing for the overall efficiency nor the pollution of the plant. Indeed, rising nat gas prices have made some operators run the more modern coal plants in preference to the CCGT plants. In the UK electricity market, they will do whatever makes the most profit. Will the operators wriggle out of the EU LCPD, pleading that they cannot produce sufficient power, if the older plants are retired early? Since the time to do something else effective has been frittered away, closing the coal plants on schedule is probably entirely unrealistic, and new plants are likely to get built as you can't build nuclear that fast and they haven't even started. As for wind energy, apart from the stonking cost of off-shore which we may not be able to afford, AFAIK there is only one ship capable of erecting the turbines, so even the BEA says that Government plans for power by 2020 are in a different reality to this planet. Since most of the on-shore wind potential is in Scotland, I doubt that they will allow a maximum speed build of on-shore wind, at least until power shortages really hurt. You could co-fire the coal plants with biomass to reduce the emissions, its not really reducing the run time but might be an option for providing some wiggle room. Miscanthus/Willow could provide about 30MWh (elec)/ha/yr which means we could stretch solid fuels by using some marginal land. IMO a better route to go is gasification for home heating (effective 60MWh/ha/yr yield due to higher end use efficiency about 3 houses worth), then using the char as soil amendment. I favour increased use of wind to power heat pumps and production of biogas (from switchgrass) to make use of existing infrastructure and stretch out gas supply. Expanding and electrifying the rail network (for food and fuel transport as much as people) in conjunction with transmission and fibre optic cables. Make better use of frequency responsive loads and real-time pricing to help secure the grid and reduce peak demands. Insulate here, insulate now, pay less. Info on Direct coal injection. I am surprised that the UK's total energy use has changed very little since 1965. Is this due to high efficiency gas combined cycle replacing older, low efficiency coal fired generators, or better energy conservation by cars, homes and industry? Energy efficiency gains might be one reason, but I guess the main reason is the move of industries that consume a lot of energy (like steel and alloy manufacuring) to the far east. I gather from CSIRO sponsored paper http://www.csiro.au/files/files/pjkf.pdf that UK total PJ went from 8425PJ in 1900 to 12155PJ in 2000, if I understand the authors''exergy' concept correctly. I did a rough check on population 1900, 1950 & 2000; respectively 38.323M, 50.290M, 58.790M, and deduce that per capita energy supply barely changed over the hundred years, actually less in 1950, and even slightly less per capita in 2000? Much of the coal use in 1900 was in terribly inefficient open hearth fires, so you can multiply the effective energy delivered by a factor of two or three for a modern gas condensing boiler these days. In 1900 Britain was also one of the largest manufacturers in the world. When faced with energy shortages, perhaps we should look to history to see how we managed during hard times. Coal for households was rationed in the UK from 1942 to 1958. In the north the ration was 50 cwt (50 x 112lb sacks) per year and in the warmer south, 34 cwt was allowed. The ration was only given if you had less than 20cwt stockpiled - which was to deter people stockpiling in the summer. As coal was the primary domestic heating fuel, often burned in inefficient open fires and ranges, then the useful energy obtained from the ration was very poor compared to today's typical household heating consumption. Average gas consumption per household in the UK is some 22,000kWh per year. Coal provides about 9kWh per kilo, but on a 25% efficient open fire, compared to a 90% efficient condensing gas boiler, a sack of coal would only provide about 2 to 3 day's useful heat - by modern standards of comfort. It would be hard to keep anymore than 1 room heated, for example, in the long harsh winter of 1947 on just one sack of coal per week. There is no doubt that the UK is heading for trouble in years to come with it's over reliance on natural gas. Note that even in summer we still use 150 million cubic metres per day - or about 50% of our winter daily consumption. Much of this is used in the CCGT power stations, that we are becoming increasingly reliant upon to keep the lights on, as ageing nuclear and coal plants are either shut down or running at reduced hours and capacity . Fortunately our heating appliances are considerably more efficient that they were in the 40's, and moder electronic controls and zoned heating allows heat to be delivered to where it is needed most. However with rising gas prices, many in the UK will be forced into cutting back on their heating - possibly choosing to heat just one room rather than the whole house. Insulation is a very cost effective way of minimising heat loss - but still over half of the houses in the UK are inadequately insulated. If our government were to act sensibly and initiate and follow through with a national home insulation and heating modernisation programme, it would not only get our housing stock up to a decent level of insulation and efficiency but create jobs at a time when the construction industry is facing a serious downturn. As a final point, it should be noted that the increasing need for the UK to import its oil and gas will have a large negative impact on our balance of payments. We may even see a grave split in the economic success of the N. Hemisphere countries - those which have energy to export, and those that don't. Many of the houses that used coal for heat also had some sort of range (you can see the type my grandparents had in some of the cottages at the Beamish museum). The coal cart came around regularly and we shoveled the coal into the bin. It was then carefully measured by the bucket for use on the fire. But it also heated the water in the adjacent boiler, so that the men folk could bathe in front of the fire, the oven was also part of the structure, and a griddle that could swing over the fire to make scones. My parents cooked on an enclosed range, which included the oven - it was a Rayburn as I seem to remember, and that was considerably more efficient. In those days coal was also mined to produce more large coal, since this was more attractive to the public - before most of the machine was won by machine and burned in power plants, which preferred to get it in the much smaller sizes that the machines produce. Not sure if this is relevant as I'm talking about electricity not gas - but last night, just north of London, we had snow and the electricity supply hiccuped & flickered several times. Today I'm buying torches and candles and preparing a small room for use in longer power-cuts; I think it's going to be a difficult winter. Since 1970 about 30 MTOE of primary energy has come off the industry sector (halving it) and added to the transport sector - doubling it's energy usage. In a nutshell, our primary energy is no longer used for making things, it's used for transporting goods and people around the country. DUKES 1.1.5 gives a surprisingly clear summary of our changing energy patterns in the last 37 years. Notably primary energy consumption has increased by just 6%, but it is the changes in the fuel usage and the changes in the various energy sectors that is quite revealing. Coal use and other solid fuels have declined in all sectors, but this has been replaced with a vast increase in the use of natural gas. Compared to our coal gas and natural gas consumption in 1970, we are now using nearly four times as much. Petroleum, once used for industry, has now been diverted to transport - this is worrying, as burning petroleum in an IC engine has got to be one of the least efficient uses for it - even compared to space heating for houses and buildings, or running industrial furnaces. Two thirds of the petroleum consumed in this country is burnt away at less than 25% efficiency. Of the 155 MTOE primary energy we use in the UK, over 30% is natural gas. Half of this is used for electricity production at approaching 50% efficiency in modern CCGT powerstations. However, would it not make more sense to insulate our homes better, and conserve the natural gas for home heating, which with a modern gas boiler, can exceed 90% overall efficiency? £5000 spent on a new heating system and better insulation, for the 12 million worst properties would have a dramatic conserving effect on our domestic primary energy consumption. £60 billion well spent and a boost to the economy and jobs, and a major energy conservation and cost saving year on year. Controversial as it is, the UK must come up with a viable policy for the increased use of coal, and invest in cleaner coal power generation possibly by integrated gasification and carbon capture and sequestration. Coal has been much in decline as a primary energy source over the last 40 years, but we should consider it as a hedge against a turbulent future for natural gas. We cannot afford to base the nation's future energy security on just natural gas. Perhaps someone might like to graph some of the figures in DUKES 1.1.5 and provide an illustration of where we are heading. I think there have been several factors at work here. People being more energy aware. Improved combustion technology for IC machines (cars, ships, air planes). More efficient combined cycle power plants. This has been observed for several of the G-7 members. with the intention of developing domestic and export markets. I wonder if that is code for sending cryogenic tanker ships (bubble boats) back to the UK. Alternatively the company could merely be trying to replace its UK revenue stream rather than the physical flow. That particular coal basin will be the first in the world to liquify coal seam gas the same way as natural gas. I recall a TV show described the benefits of gas fired combined heat and power. The implication was small town first (Woking?) then London next. Nary a mention of gas supply problems. There will be no "sending (bubble boats) back to the UK" the gas will be sold for the highest price wherever it may be obtained. all this must go a long ways towards explaining why tony was such a rabid supporter of the PNAC plan... his energy production peaks just as the PNAC project was getting underway. nabucco seems to be dead in the water since putin's agreements with central asian producers... unless, of course, iran is plumbed into nabucco... and what about nord stream? ...russia's in the doghouse horrible bad since putin repossessed the oligarchs' oil and gas... judging from the hysteria from american neocons (and UK resident guest worker berezovsky), those oligarchs were most likely part of the neocon PNAC plan to achieve "benevolent global hegemony" through control of energy. will the brits hold out for regime change in iran and russia, or will they come to their senses and abandon the PNAC project? Does it matter that much? Iran has had to stop exports in both of the last two winters because their own people were freezing. Whatever Russia could theoretically supply they are still behind the eight ball on infrastructure, and with the current depression, unlikely to catch up soon. if the UK abandons the PNAC project, they might have some influence on the PNAC puppet governments in poland and ukraine, who are the main PNAC line of resistance... along with saaki in georgia, of course. ...although yulia the ukrainian gas princess may be seeing the light a little bit... it's hard to tell with her, though, seeing as how it seems to be she's for yulia, first, last and always. anyhow, if poland and ukraine came to their senses, then the brits would have a lot better chance of staying warm, dont you think? i mean, it's a really radical concept... cooperation, instead of bombing people... on the other hand, maybe if iran could concentrate on their infrastructure, they'd be able to develop that south pars field before the brits all freeze to death. you can drag this map around to take a look at asalouyeh, where iran's south pars gas comes ashore. What is behind the acronym PNAC? I assume it's Project for a New American Century, the Neocons. Iran was a (cumulative) net importer until 2007 when they had a (cumulative) small net export. However, during winter Iran still needs to supplement its demand with imports from neighboring Turkmenistan. When it comes to energy resources Iran and Russia has many similarities. Iran having the world’s second largest nat gas reserves has for some time worked to increase domestic usage and develop exports for its nat gas reserves. Increased domestic nat gas consumption would free up oil for exports. Increased domestic nat gas consumption would free up oil for exports. ...but it's apparently beyond neocons' power of reason to understand that nuke powerplants would free up gas for export. ...and nevermind that iran's nuke power ambitions go back to the days of the unfortunate shah, who thought oil was a "noble substance", and deserved a better fate than to be burned in some yuppie's hummer. project for the new american century, most known for their yearning in september of 2000 for a "new pearl harbor" to kickstart the project... many of these people were subsequently installed into positions high enough to make their "new pearl harbor" happen in the 2000 election, which hinged on a recount in florida, which was governed by the president-elect's brother and PNAC member, jeb bush. PNAC is a spinoff of the AEI, aka american enterprise institute, augmented with a few token corporate fascists like cheney and rumsfeld, and a radical christian or two. the parent, the AEI, is allied with the likud party of israel, and they are probably on tenterhooks, waiting to see if their boy bibi gets back into the israeli drivers' seat. meanwhile, the AEI and exxon are the world's foremost deniers of global warming, and lee raymond, an ex exxon CEO, is co-chairman of the board of the AEI, and chairman of bunnypants' energy advisory board... he was most likely a kingpin in cheney's secret energy meetings before the invasion of iraq. One must hope that Obama who says he is going to change the world is going to try and change it for the better. There's a website that gives non-americans a chance to "vote"
McCain is ahead in Albania and Macedonia but losing everywhere else. ...both wholly-owned subsidiaries of arch neocon cheney's halliburton outfit. all right... that's a little exaggeration. ...but those results are an amazing majority for obama. at some point, you gots to give up on coincidence. What is the light green in Figure 5? Figure 5 has been revised and reloaded with the full legend. The light green in figure 5 is storage withdrawals. It is illustrated thus to underline that supplies from storage represents the “last” line of defense to meet demand. Thanks Rune, that's very interesting. As you were saying, Ireland it at the end of a very long pipe. Natural Gas is about 26 - 28% of our total energy requirement, but here's the killer - it is used for 50-60% of our electricity production. Some of that plant is dual-fuel though - can run on distillate. I don’t think there are many nat gas importers/countries that have based 50 – 60 % of their electricity production on nat gas. Doing an estimate based upon data from BERR and BP Statistical Review 2008 resulted in that Ireland imported 4,6 Gcm of its total consumption of 4,8 Gcm in 2007. In other words, Ireland imports approximately 95 % of its nat gas consumption. In 2007 Ireland produced 27,2 TWh of electricity and roughly based on your information approximately close to 3 Gcm was used for electricity consumption in 2007. Based on present prices of nat gas at the beach it could be expected that some of these dual fuel plants (both in UK and Ireland) could switch to distillates due to price. This if the oil prices continue to decline. The UK generating mix is already heavily biased to natural gas. With the recent shutdowns, retirements by 2015 and reduced operation of some of the coal fired and nuclear plants, the percentage of power generated from gas will increase, until new plant is built. BERR predictions of the UK future generation mix suggest that by 2020 approximately 55% of our power could be generated from gas, as up to 25GW of replacement capacity is needed. This clearly reduces the fuel diversity and further increases energy insecurity. We will find ourselves even more at the mercy of the gas exporting nations, with an ever increasing demand for gas. If gas prices are rising, power generating utilities may well prove reluctant to build new gas fired plant. Would you invest an build a new gas power station with a lifespan of 40 years, if you could not predict the ballpark figure for the fuel costs in even the next 10 years? Power companies will probably try to wriggle out of the EU large combustion plant directive, and keep the older plant running. Whilst fines may be imposed, this might be cheaper than paying the spiraling gas bills. It remains to be seen if the gas will be there. Would you invest an build a new gas power station with a lifespan of 40 years, if you could not predict the ballpark figure for the fuel costs in even the next 10 years? A gas fired power plant requires less funding and construction time than a similar one fired with coal or a nuclear one. With the ongoing global credit crunch, that most probably will become worse, it will become easier to finance a low cost power plant than a high cost. The fuel cost is possible to pass on to the customers. While not a country, California generates over 40% of electricity from natural gas, and we import 85% of it. We're also at the end of a very long supply chain. Is that close enough? I think it was Matt Simmons that classified California as an energy island in several of his presentations. The prospects of medium future nat gas supplies in the US looks presently good, and better than for UK and Ireland. When you consider the few options most people have for cooking at home I still find it mind boggling any gas at all is burnt in power stations. Cooking on wood fires or using electricity (it's really not that efficient to heat up something, power a turbine, turn it into electricity, then turn it back into heat is it?) have their own inherent problems, only gas is easily transportable (without oil!). Needs must, but it seems (spotting a theme here) monstrous short termism. Add to that the fact that they can be built quickly, do not need huge capital, burn with low NOx/SOx at pretty much the highest efficiency of any fossil fuel and (for the next 40 years at least) have the stuff right under our/other EU countries feet. You might also reverse the question: why do we use gas for heating homes while we can also go the route of electrical heating? "You might also reverse the question: why do we use gas for heating homes while we can also go the route of electrical heating?" With a modern gas fired condensing boiler, approximately 90% of the fuel energy will contribute to the heating. If you first convert gas to electricity in a modern CCGT plant, which is close to 50% efficient, only about 45% of the fuel energy will actually reach the home. (After transmission, transformation and distribution losses). So we burn gas in our homes because it delivers roughly twice the efficiency of using electrical heating. This is mainly the GasTerra-Centrica contract, originating from the (mostly off-shore) Dutch hi-cal gas fields. The local Dutch grid is flowing low-calorific gas from the Groningen field, but the rest of Europe uses hi-cal, so almost all hi-cal gas is exported. Through the Dutch network the BBL is also a connection to the German Emden hub. At the moment it is a single-direction line can only flow into the UK as opposed to the Interconnector. I am however a bit sceptical of this whole "we're no longer exporting gas we're all doomed" sentiment that seems to have taken hold of Britain. Spain, France, Italy and Germany have always been without gas and are coping quite well, not to mention Japan. Diversify supply, negotiate your long-term supply contracts well and build enough storage. It might not be as easy (or lucrative for the UK Treasury) as pumping it out and taxing it, but it's not rocket science. Check back through some of the key posts on this site on future likely supplies of natural gas. Whatever has been the case historically, natural gas supplies are likely to become very tight. The supplies of LNG that the UK was counting on are just not going to be available, and what there is will be at a high price. 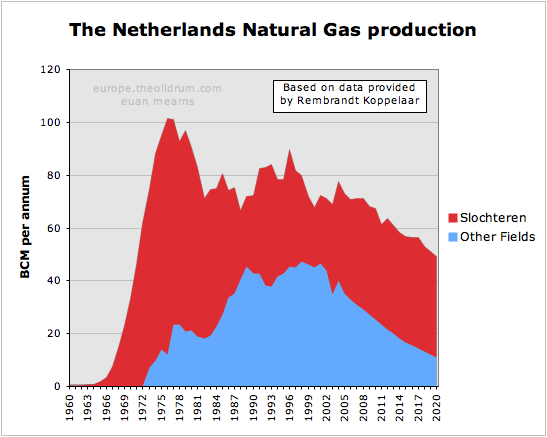 Netherlands nat gas production is in decline, ref this diagram . From what you describe the sources of gas exported to UK are in steep declines (ref the blue area of the referenced diagram). This suggests that imports to UK through BBL will soon start to decline. This aggravates the UK supply situation, and imports could start to decline as early as this winter. Your description of high-cal gas suggests that this gas contains C2, C3, C4 and perhaps some C4+ (ethane, propane, butane and heavier). Does this gas need any treatment (like extraction of some of the heavier components (C2, C3, C4 evt.C4+) before it is sent out to the customers) to meet sales gas specifications? I am however a bit sceptical of this whole "we're no longer exporting gas we're all doomed" sentiment that seems to have taken hold of Britain. Situation is that few countries has allowed nat gas to take such a central role in its primary energy supply like UK. If anyone could point to any sources that could make certain beyond any doubt that UK is not facing a nat gas supply crisis in the near future, I for one, would think that would be wonderful. I have followed the UK nat gas supply situation for some years and chances are absolutely present (more than 30 %) that UK will experience a nat gas shortfall this winter. Basis of it is that the by far biggest Dutch field (the Slochteren field in Groningen) contains gas with lower calorific value than the Norse/Dutch/British/Danish North Sea fields. The whole Dutch low-pressure (residential) grid (and part of Belgium/Germany that border the Netherlands) was originally built for this low-cal gas and is now more or less isolated from the UK/German/French grids around it that use another spec (hi-cal). You can convert hi-cal into low-cal by injecting nitrogen (a few of these installations exist in the Dutch grid), but not the other way round. This is obviously not sustainable as the Groningen field will run out at some time. The whole grid will (gradually?) have to switch to hi-cal gas at some point. This suggests that imports to UK through BBL will soon start to decline. Not necessarily, as the other end of the BBL is connected to the rest of the Continental grid and can just as well flow Russian gas, LNG from the continental terminals or gas from continental gas storages. France built nukes, Germany kept using coal/lignite, and the Med still burns oil. Choosing gas as its main generation fuel is a choice the UK has made, and IMO not an unreasonable or bad one (esp considering the big opposition against nuclear). It's not a choice for eternity - gas fired generation is cheap to build and has low abandonment costs. If gas gets too expensive, watch wind/nuke/coal/etc take over again. No mention in these comments of combined heat and power. According to statistics from the Dept. of BERR, the UK throws away more heat from power stations than the amount of gas which it uses to heat buildings. London is surrounded by nearby power stations. Go to Denmark and you'll note that almost all built-up areas have piped heat. Basically, warm homes for all using waste heat from power stations. Some of the heat comes from industrial waste heat and a growing amount of biomass, solar and geothermal. In 1980 (yes, the UK moves slowly) a government report, Energy Paper 20 I think, showed that CHP/DH would be a cheaper method of heating than either synthetic natural gas or electric heat pumps. The running cost was roughly on a par with natural gas. Had they studied Danish technology, which is much simpler than that used in some other European countries such as Sweden and Finland, it could be cheaper than gas. Fuel savings? Huge. In western Copenhagen, according to the Danish Board of District Heating, 1 kWh of heat delivered to the consumer's radiators consumes just 0.13 kWh of fuel (either gas, coal or biomass). This compares to about 1.1 kWh of fuel consumed per kWh of heat using a condensing gas boiler or an electric heat pump with a COP of 2.6. I totally agree with the earlier comment about Canadian houses. I had a Canadian visitor in 2004 who was shocked that in his UK hotel room he could see daylight all around the window frame. Things haven't changed in the last 4 years, except that a few people are trying to superinsulate their existing house - much as a few Canadians were doing in 1980 (see e.g. THE SUPERINSULATED RETROFIT BOOK). The UK energy industry has been ridden over rough shod for almost the last 30 years. It the late 60s, early 70s, we as a nation, realised that we had been left a marvelous legacy in the form of North Sea oil and gas. Whilst CHP and district heating schemes are clearly one of the most efficient means of using primary energy resources, the UK thought why bother, when we are awash with oil and gas. Well, we've now blown our inheritance and we are now skint. I'm also in favour of CHP, but the obstacles in the UK are formidable. For a start you would have to build the plants, and in the UK traditionally we have gone for larger, rather more efficient plants rather than the smaller ones which work better for CHP as they are closer to pump the water. You would then have to build the pipework to transport it. Typically in, say, Holland, most people live in apartments, which are a lot easier to plumb in than houses. If we had infinite supplies of gas, which has always been the assumption, then current practise of piping it to houses and using a high efficiency burner is not bad, and you are unlikely to get much more efficient, certainly not by burning the gas centrally then piping hot water. The great advantage of CHP is that you can use waste etc to produce it, but converting our properties would be a mammoth undertaking. District heating schemes were trialled in the UK in the late 1940s with the opening of Battersea power station, supplying heat to nearby housing estates in Pimlico. Unfortunately there is the problem of what you do with the heat during the summer months, I think Battersea resorted to steam condensers cooled by the Thames. My home town has a 50 km long district heating pipe for selling cheap heat from the local garbage incinerator. I think it is the longest in Sweden but the limit for 100:s of MW of CHP capacity is not pipe lenght but the capital and time needed for hooking up a major city. Thanks for the info, Magnus. Can you provide any information on how expensive town plumbing for every house is in hilly regions? It would seem to me that pumping all that hot water around would be very expensive. Not that that is a show-stopper, as there are plenty of towns in the UK which are relatively flat - I wouldn't fancy paying for the pumps needed to push it round Bristol though. In a pressurised hydraulic network (ie. a pipefull of water) hills are irrelivant. Its a bit like your central heating system, the only work the pump has to do is overcome internal friction of the water on the pipe inner surface. Essentially all the water that ends up at the top of a hill is countered by an equal amount coming back down the hill. That said, circulating large quantities of water round a district heating system will require large pumps and a huge infrastructure investment. Not only that, but in the UK most of the major power stations are prohibitively far away from major population centres for it to be achieved. The dominating cost is the investment in insulated buried plumbing. The cost depends on the density of houses and the ease of digging and that depend on both nature and previous infrastructure that is in the way. There has been and is a development of pipe systems that are easier and cheaper to lay down. Its is impossible to give a cost withouth knowledge about the location. A minimum comparision is the cost for replacing all of the drinking water system. A district heating system needs more advanced pipes with insulation, two sets of pipes, has a fairly unexpensive electronic leakage detection system but all fit in one ditch and the digging is a large part of the cost. But an ok first guess could be doubling the cost for a complete remake of the water distribution or natural gas distribution within a town. Do not compare with the cost for sewage systems as they mostly have to work by gravity. Pumping the water is a minor cost and exept for the losses in the electric motor you recover the energy as friction heating within the system, but that is only a curiosity. I didn't see any mention on housing density. If millions are going to be unemployed millions are going to stop making house payments and then presumably not long after millions will be finding new arrangements. If folks double up, especially if they're abandoning the less well insulated properties, that would have some effect, but how much? The local authority in the UK has the obligation to re-house people, so it will be people moving from one house to another, and often rental properties are the worst insulated. Some kind of part share of the property, so that it is part rented by the former morgagee, is also likely in the UK. The whole legislative and social security system in the UK is different to the States. Here people will be evicted for failure to keep up with a mortgage costing, say, £500pm, and housed at taxpayers expense often in bed and breakfast accomodation until something more suitable becomes available at a cost of maybe £2,000pm, whilst the taxpayer is simultaneously supporting the banks who are foreclosing. Not many sleep in cars though, save perhaps for the single. So does this mean that the Brits will freeze their butts off? That thought really warms my Scandinavian heart. The Norwegians should raise the gas prices. Presumably this is some sort of back-wash to the British Government's immoral treatment of Iceland, and their perversion of the use of terrorist legislation to seize assets. Maybe you agree with everything your Government does, but not everyone here does. As for the rest of your crass comments, you may find it amusing that pensioners here will likely die of hypothermia, but you are just displaying your immaturity. None of this is a joke, and real people in many lands are going to really suffer soon. Thank you Dave, I couldn't have put it better myself. Many Danes live in detached or semi-detached houses and their designs for low supply temperatures and directly-connected systems make DH more workable in districts of small buildings. Go to "Marstal, Denmark" on Google maps and to the west of a small town of 3500 people you can see a field of solar collectors that help to heat it. You can also see that a typical household in Marstal lives in a house in its own garden; there are not many flats. Lord Walter Marshall after he'd chaired the technical committee that produced Energy Paper 20 said something like: "District heating looks a really good idea but in the UK you have a choice of how to get it, you must either abolish democracy or abolish British Gas". Well could BG be in the process of abolishing itself as the supply of fuel into the pipes becomes unreliable and more expensive? CHP plants can store a tankful of backup fuel such as LPG at the plant (or under it) and use an interruptible gas tariff. That helps to substitute for gas storage (which we don't have enough of in the UK). Lower gas consumption (15-20% as much as using a gas boiler) and more security seem fairly good ideas in these times. I'm fairly in favour of CHP, providing in the UK context it does not involve too much biofuel, as that is difficult in a small, crowded island. You my horror Drax intends to build 3 biofuel plants, total around 900MW, and plans to import much of the fuel, presumably further denuding 3rd world topsoils. The big problem with CHP though is the time and investment it would take to implement it. Where it is a case of utilising resources such as refuse which would otherwise go to waste it is obviously a good idea. I think the UK's challenge will be to stretch out its gas supplies. We can reduce the amount of gas used in home heating by improving insulation and solar water heaters. Replace rural electric/oil heating with heat pumps powered by wind (+50% capacity factor during winter months) or run of river hydro schemes. Since most power is transmitted towards the south of the country, concentrating the effort here would help to cut transmission losses. For areas that are already on the gas grid, CHP could be retrofitted. I am sure there are many ICE's with a fair amount of run time available from scrapped/ crashed cars and diverting some of the current manufacturing capacity away from the crashing global car market. Biogas and/or hydrogen can be mixed with natural gas at about 20% each. AFAIK biogas and natural gas have been used together as has natural gas and hydrogen, but I am unaware of the three being used together. Hydrogen electrolysis as far as I see it will only ever be useful /economic as a large load levelling application to take excessive power (during windy nights) natural gas and electricity will always be cheaper than the equivalent energy in hydrogen form both can be converted to end use in highly efficient ways. Biogas is a much better biofuel than liquid fuels and has a much higher end use efficiency (space heating, CHP etc) It can also be made from a wide variety of feed stocks and use existing infrastructure. Feed stocks could also be grown intensively from the waste heat and CO2 from thermal power stations. National grid 7 year statement from 2006. Got some useful graphics included. Biogas from drought resistant crops. Agree with you about not too much biomass in UK power stations. DEFRA official figures http://www.defra.gov.uk/erdp/pdfs/ecs/miscanthus-guide.pdf suggest that the most efficient biomass producing crop in our climate, Elephant Grass, miscanthus, might produce on average 12t - 16t dry 'wood' per hectare per year. Defra make a comparison with coal by calculating an average of 8t of equivalent power station coal per 20t of 'dry' biomass. (Though field dry biomass moisture content must vary, this defra calculation might seem a conservatively low figure for coal equivalent, but even so, upward revision would not much alter the overall position.) From defra, as quoted above, an average "upper bound" of >16t/ha, biomass could be 6 - 7t of coal equivalent per hectare. UK has around 12M hectares of 'cultivated ground' of which a maximum of about 7Mha was ever ploughed (in extremis in WWII). If the whole of a UK 7Mha hectares produced miscanthus biomass it might substitute for ~50Mt of the ~70Mt coal presently used in power stations (coal producing ~36% of UK electricity). UK imports 45 - 50Mt coal presently almost entirely for power generation and produces domestically less than 20Mt. To be more realistic, biomass might usefully substitute a smallish fraction of heating for UK homes if the latter were much better insulated and preferably were fed hot water from CHP district heating. You are right - biomass for UK at the moment means massive imports, probably at large environmental or other cost. Even then it could only substitute a small fraction of coal imports. You might want to check out information on the Chariton Valley experiment. They harvested, stored and burned switchgrass to see how it would do as a coal replacement fuel. In a paper that I mentioned in a post over a year ago the costs to get the switchgrass to the power plant came in at around $60 a ton as I recall, and it cost an additional $20 a ton for processing at the plant (getting it out of bales and then grinding it). The plant manager could not see the economics of replacing $20 a ton coal with the biomass. And the group had to jump through all sorts of hoops with the EPA to get permission to burn the grass, requiring that they used weedkiller on the land so that only approved species for burning would be in the mix. You are right on track with insulation upgrades. Many of the things suggested do not take very many resources and can be implemented quickly, for example reducing drafts with plastic, insulating attics, closing off one room. Needs government leadership to really have a high uptake. The coal strikes of the 1980's in UK should have been a good practice for now. Longer-term, with all the gas fired electricity capacity, land-based wind power will work well in combination to reduce peak winter gas demand and can be build rapidly once the approval back-logs in Scotland are reduced. It is doubtful how quickly the insulation industry can be ramped up. The stop-start nature of Government grants has led to a anaemic industry, with many cutting back as recently as this summer. If you couple this with the fact that actual penetration of wind power in our experience to date has been limited to around 20% of the grid, except where it is part of a much larger system such as Denmark which can export electricity to the rest of Europe and make use of Scandanavia's hydropower reserves then over-reliance on it's potential in this country does not seem wise - the US is an altogether different case. As a long term project, the Severn barrage provides some hope. Run of stream hydropower would also seem to be far more limited in the UK than in the US. It should be taken with some caution though, as it is a work in progress, and in particular seems to have massively underestimated wind power potential, but the fact remains that this is a small island, where most of the energy resources are concentrated at the northern and western peripheries far from the major centres of population. In my view the only possible way to power this country in the medium term is via nuclear energy. A build of around the same number which already exists in France but with modern large reactors together with air source heat pumps, better insulation etc should be sufficient to run the country at an advanced technological level. That is not to say that there are not huge challenges getting to that point, or that it will stop us getting cold in the meantime. Fuel supplies are of some concern, although since they represent a tiny fraction of total costs far less rich ores could be mined, and there is no imminent shortage. Nevertheless it is true that advanced technologies to increase the efficiency of fuel burn have not been fully developed, and a rapid track approach to this would be needed. In summary I can see wind power contributing, but not solving the problem. These are very much preliminary, so please pitch in! I am looking at the idea of rationing, and combining that with smart metering. In Italy, I believe, or perhaps France (more info, anyone?) they have a system where you are limited on the number of kilowatts you can burn in a day. I am not sure if this is an absolute cut-off, as I seem to recall, or merely results in a much higher charge per kwh. This alone could have an impact, but the suggestion I am trying to formulate would involve using houses and offices effectively as batteries. This already occurs to a limited extent through a system of cheaper night rates, so that night storage heaters are used, but I am trying to look at the possibility of a much more sophisticated system which would also make up for some of the vagueries of wind. This might obviate some of the need and expense of back-up as it would be inherent in the system. Essentially what you might have would be central control of heating, so that as power was available heating would be switched on, warming the house and water tanks, and then turned off. So you would have a National availability grid. You might wish to look at dynamic demand control. If you measure the frequency of the mains at any socket outlet across the UK, it should be close to 50Hz between certain legal limits. If the frequency is greater than 50.00Hz, then there is an excess of power available on the grid. If below 50.00Hz then the generators are struggling to meet demand, and if possible any unessential loads could be shed. The dynamic demand solution is to monitor the grid frequency and only draw power from the grid when it is >50Hz. This is appropriate for equipment such as storage heaters and freezers, that have energy storage capacity, and as long as they receive a certain minimum kWh per 24hrs they continue to function. Have a look at the Dynamic Demand website for more information. Realtime grid frequency information is available on the National Grid Company website. Grid frequency can easily be measured using a 50p microcontroller from any power socket anywhere on the national grid and used to activate a relay to cut off freezers, heaters and immersion heaters. A tremendous resource. Many thanks. One area he has not looked at as I link in my post below is the potential of Time of Use metering, which can have great results, together with charging systems which reward suppliers for reducing use. That is a great link to the 'Dynamic' site - thanks! I am wondering what can be done to publicise this initiative - xeroid? If NG is limited and not the capacity of NG generators, then any amount of wind or nuclear is going to save NG for use at peak times. Since wind peaks in winter in UK, its a good match over weeks, but not days, but then NG can be stored for several days and used during days of lower wind. Medium term, probably CO2 heat pumps for hot water and space heating to replace NG and additional insulation is going to be the most cost effective. I am not sure why there is a limitation to increasing production of rock-wool( blown slag). It should be possible to ramp up wind capacity by 33% pa, as has been done in other countries, even if 20% of capacity is a limitation, that could displace a lot of NG. The UK is fortunate in having many good pumped storage sites close to the best wind resources in Scotland, but while significant NG is still available, NG is a cheaper option. In any case by the time wind accounts for 20%, new nuclear plants should be coming on-line, at least to replace retired plants. One option for co-generation is to use direct injection of coal/water slurry in a diesel generator(DICE). Dr Wibberley at CSIRO, has been promoting this, as it is very flexible in demand unlike most other coal fired power and is 54% efficient at producing electricity, plus generating water at 95C that can be used for commercial or residential heating. The diesel engines can handle high sulfur coal. Another advantage is the small generator size 10-100MW. Hi in Italy the standard arrangement with electricity is 3KW per house. If you try to use more than that the power trips. One of the best incentives ever to running appliances consecutively not concurrently! You can pay more for a higher allowance - IIRC it's a few K euros to get up to 10ish KW+. Unlike in the UK they also bill you more the more you use. The electricity lacks the clout of the UK's 25KW - they don't have electric kettles or toasters - in our house there if you put the washing machine on the lights dim! The electricity supply is so 'stretched' that if we use our full whack (actually closer to 2KW - it's been measured) our neighbours cooker fails to heat up. That sounds quite hopeful for the UK, although of course it is colder here for longer than in most places in Italy save for the mountains. At the moment the UK Government seems to be going for the straightforward rationing alternative of letting the poor freeze, presumably also reducing the pension bill in one masterstroke. It is also notable that the Italian government, for chrissakes, has managed to come up with a better pricing system than the British Government. In the US and UK it seems that there is some sort of end of Empire decline, to the levels of incompetence which was legendary at the close of the Spanish and Turkish Empires. Governments always seem to be like this after in power for >10 years, remember Thatchers pole? tax. We had 11 years of Howard's global warming do nothing denial. Unpopular governments become afraid to act, and thus become more unpopular. Your comments about insulation/energy saving schemes being over-subscribed in 24 hours, is very telling, imagine what could be done with an open-ended scheme. Rationing can work, has worked and will have to be implemented, and only then will governments start to solve the problem, to get out of the terrible rationing situation. Most Australian cities have introduced water rationing, before having to have pensioners dying of thirst, so I can't see why your government is being slow to introduce electricity rationing. A positive action even if initially unpopular, soon develops its own momentum and political support. Many of the policies which have brought ruin were there from the earliest days of the present administration, for instance the separation of supervision of the Banks. It was part of the 'New labour' philosophy to continue parts of the Thatcher legacy, such as giving banks free reign, and they have enthusiastically taken part in the executive perks bandwagon. In 2003 they declared a nuclear build unnecessary, and adopted total reliance on the market to deliver energy whilst failing to put in incentives to build other than plants burning natural gas. I don't think the other crew are any better. Both in the US and UK the establishment now seems to be terminally corrupt, and changing parties makes little difference as they are both beholden to the same people. If you had a power rationing device that was controlled by dynamic demand. Let's suppose it allowed up to 3kW draw, and then dynamically limited the current so that the total draw didn't exceed 3kW. This is more acceptable than a complete trip out. If for example, you were running the washing machine on a heat cycle and then turned on the kettle, it would suspend one of the high power loads until there was sufficient power available. By linking it to dynamic demand, it could allow you to exceed 3kW draw, at times when there was a surplus on the grid - and this would help with load balancing. Any consumer who opted for dynamic demand, would be rewarded with a considerably lower tariff for the power drawn during the grid surplus times. This system could be adapted for those heating by electric storage heaters. One criticism is the inflexability of the system - anyone who has had night storage heaters will know that they are cold by 5pm - just when the heat is needed. By putting the storage heaters on a dynamic demand control, they could continue to draw power throughout the day, at times when the grid was lightly loaded, and disconnected instantly that the grid became critically loaded. For this to work, you need co-operation and commitment from the electricity suppliers. This will be difficult to achieve because the utilities are resistant to introduction of Smart Metering and the cost of additional equipment in consumers homes. 3 kW! In Sweden are houses allways conected to three phase power and you can not get less then 16 A, 11 kW and the utility connection is never built to only handle so little. Apartments often only have single phase but usually 20 or 25 A, 4,8 to 6 kW. And I even think it is illegal to build the system so weak that one customers full use of power affects another customer in a damaging way. The per capita production capacity is 3 kW and almost all of it is non fossil power although most of it is used for industry meaning we have roughy a one in ten risk to get a winter cold enough for a power shortage. A study needs to be done of preserving the gas reticulation network for say 50 years vs. abandoning it for electricity. As discussed CHP is very worthwhile if you have the gas. Another potentially huge tradeoff is home refuelling of natural gas vehicles instead of petrol or batteries. That may mean when natgas is unaffordable or the Russians become overbearing that alternative gas will have to replace natural. I doubt there will ever be enough fermentation methane since I believe Swedish rail is now pinching it off other users. Thermochemical syngas such as plasma gasification of garbage seems to be floundering with low EROEI. It would also require tar scrubbing and catalytic conversion to a methane dominant mixture to inject into the existing gas network. Perhaps nobody can say yet if propping up the gas network for a few decades is even a worthwhile exercise. Pros - CHP, sunk cost, home fuelling of cars, low net carbon. Cons - inadequacy, needs high EROEI support such as nuclear. ...and why would the russians become "overbearing"? ...maybe because PNAC has installed hostile puppet governments in europe, central asia and the caspian regions in an attempt to isolate russia from its natural markets? the big problem seems to be putin, doesnt it? in 2001, israeli russians ---yukos guys and others--- were still in control of russian energy, thus ensuring oil supplies to israeli america once israeli americans begin tearing up the middle east oil patch in their project to rearrange the middle east to israeli spec... and exxon, shortly after 9/11, signs the sakhalin deal with russia, scheduled to become the largest foreign investment ever in russia..
but the handwriting was already on the wall as gusinsky, the israeli russian media oligarch, had already been purged, and had fled to israel. ...this handwriting, pointing to eventual expulsion of the yukos oil jews and other israeli russian gangsters, contributed to the urgency of getting the 9/11 project underway, in hopes of generating enough sympathy that putin would allow israeli russians to remain in control of russian energy.... by late 2003, the handwriting become so obvious that khodorkovsky, the israeli russian boss of yukos, attempted to sell yukos to exxon, then run by CEO lee raymond ---the same lee raymond who became the vice-chairman of the board of the israeli american AEI think tank. by the end of 2004, the yukos oil jews and berezovsky were purged (most of them fleeing to israel), causing howls of outrage from the israeli american press and neocons like richard perle--- who is probably one of the masterminds of the whole dismal 9-11/PNAC project. and so the israelis and israeli americans would have to proceed with the PNAC project without guarantees of russian oil supplies in the event oil production was disrupted as the middle east was remodeled. all we need now, to confirm that america is on the same course as the sovs were as their empire collapsed, is high-class gang warfare, as oil executives and government officials are gunned down (by each other) in attempts to determine who's boss. But if investors no longer think the UK's banks are at risk of collapse, they then look at our other vulnerabilities - such as public sector borrowing which is rising very sharply because of the costs of the bank rescues, dwindling tax revenues and the need to spend our way through the economic downturn. They also look at our structural trade deficit and our huge reliance on financial flows generated by a City of London and a financial services industry that's shrinking fast. As I've pointed out in a tediously repetitive way, the sum of all we've borrowed - the aggregate of corporate, personal and public sector debt - is equivalent to three times our annual economic output. That's a vast amount of debt to repay - and it's all the harder to do so at a time when our most successful industry, financial services, is in some difficulty and the global economy is slowing down. With financial services accounting for maybe 25% of the UK economy, and the bail outs and recession-induced deficits barely getting started, it seems possible that the debt ratio would climb to perhaps 5 times GDP, due to both extra spending and a shrinking economy. The currency would be likely to collapse before that though. In my view, massive power cuts and shortages for years are now inevitable, and it is difficult to see how the imports needed for renewables and nuclear build will be funded, as the country is likely to go over the edge of bankruptcy.